Known to not pay winning players. Games are on tight side. Betfair is not available to US players. Betfair is best known as a sports betting exchange. It operates differently than a traditional sports book. Betfair sports players place wagers against each other, not the house. Players post prices that they are willing to pay for a match. This may include a point spread, money line, total, or any combination. Betfair matches players that agree on a specific term for a wager and takes a commission from the winner. Betfair also spreads poker and casino games. It uses Playtech for both platforms. Its poker network is called iPoker. Betfair announced a merger with Paddy Power in August 2015. Betfair does not accept players from the United States. Other banned countries include France, Belgium, Greece, Turkey, Germany, Portugal, Canada, Slovenia, China, Japan and Mexico. Betfair once had a spectacular reputation. It suffered many hits over the past few years, including the Betfair poker room and site. Betfair offered one of the best promotions in online casino history in November 2010. It was called Happy Hour. Players hit the promotion hard, which awarded bottomless bonuses with incredible wager requirements. Betfair reneged on the promotion and refused to pay winners but kept all of the losses from players that expected different odds. This landed Betfair on many blacklists across the Internet. The Advertising Standards Authority in the United Kingdom admonished this practice. This still did not get players paid. Casino scams are not the only rogue activities Betfair is guilty of committing. It introduced a premium fee for winning sports exchange players. In some cases, this was forced retroactively on past wins. iPoker used to split its network into multiple tiers. This gave the larger operators a better player pool compared to the smaller ones. In 2015, this stop after the network changed the way skins are paid and VIP programs are calculated. 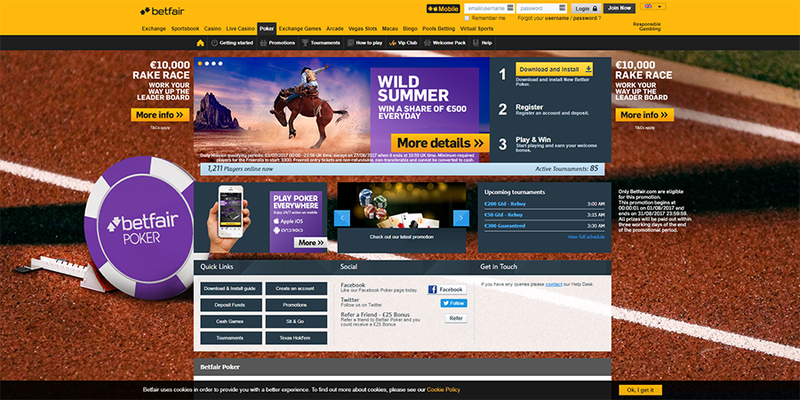 Betfair Poker is a member of the iPoker Network. This gives it a wide variety of loose games shared by many poker rooms that are predominately sports books. The first deposit bonus and VIP program are competitive. Betfair pulled off one of the largest online casino scams in history during its Happy Hour scheme. It is difficult to give them any credibility after how it handled the situation. It tried to blame players for winning with rules that made it nearly impossible to lose. The fact Betfair thought the scam it pulled during the Happy Hour promo was a decent way of doing business keeps me away. You never know when Betfair will decide it does not want to adhere to its own terms and conditions. Betfair only operates in countries where there is proper licensing or a minimum ability to process payments. This means that players do not have to worry about slow payments. Betfair players may withdraw by Neteller, Skrill, Clickandbuy, PaySafeCard, check and electronic check. Betfair was acquired by Paddy Power in 2015. This brought some quality management into a site that struggled with doing the right thing. While Betfair got away with a massive cash grab related to its Happy Hour promotion, that was another day. Betfair Poker is probably a safe choice, though we would still discourage doing business with it, especially considering the number of safe options available to players in countries Betfair accepts. We recommend choosing Betway over Betfair. Betfair offers new poker players a first deposit bonus of 200% up to $1,000. The bonus clears at a rate of 100 Status Points for every $1 in bonus. Status Points are earned at a rate of 25 for every $1 in rake paid. This makes the bonus equivalent to 25% rakeback. The bonus releases in $10 increments and expires after 45 days. There is a no deposit offer that gives players a $5 Twister tournament entry, $10 in tournament tokens and $10 in playable casino bonuses. Betfair offers a poker VIP program. There is no minimum rake to quality. There are 10 monthly and three quarterly tiers. The return of cash back goes up with most tier achievements. The above chart is based on an exchange rate of 375 Status Points for $1 in cash. No Limit Hold’em games are available up to $5/$10 blinds. Fixed Limit games are available up to the same limits. However, there are virtually no games available. Pot Limit Omaha and Omaha High/Low may be found up to $5/$10 blinds. Sit and gos for No Limit Hold’em, Pot Limit Omaha and Pot Limit Omaha High/Low are available up to $10 at all hours. Limits up to $100 may be found during peak hours. There are also Jackpot Sit and Gos where players will be awarded $35,000 if winning six in a row. There are only four games spread by the Betfair poker site. They are Texas Hold’em in no limit and fixed limit, as well as Omaha and Omaha Hi/Lo in fixed and pot limit. All games have the same stakes available. Has There Ever Been a Scandal at Betfair? The Happy Hour promotion scam was one of the biggest in the history of online gambling. It lured players in with great bonus terms and then changed them after players won. It did not even reverse player losses incurred during the promotion. Players should never, under any circumstance, trust Betfair promotions. This demonstrates that they will refuse to honor them if they do not win enough money from players. Premium fees taken from winning sports bettors is another scandalous decision made by Betfair. It affects less than one percent of players but shows that the site punishes winners that are successful with its sports betting model. Betfair has been known to take these fees from bets won in the past to punish winners. Does Betfair Poker accept U.S. players? No. Betfair does not accept Americans. What countries does Betfair not accept players from? Betfair does not accept players from Canada, Mexico, France, Belgium, Portugal, Turkey, Japan or China. Which network is Betfair on? Betfair is on the iPoker Network. Betfair is a part of the Paddy Power company. Betfair was acquired in 2015.